ALI is boxing movie with an revolutionary racial spin.The movie takes us back on the life of Cassius Clay also known as Muhammad Ali.The movie features Will Smith as the lead role of Muhammad Ali and is directed by Michael Mann.On the outside this movie seems like a marvelous portrayal of flashy lifestyle of Muhammad Ali inside the ring on the way to heavyweight champion.However what the picture truly betrays is the influential life story that you could never find on ESPN Top 10 highlights of all time. The broader meaning of the film is about Ali’s Islamic beliefs and powerful stand of the depression on the African American community in America.The director showed that with great acting by Will Smith and camera work to bring your eyes away from the ring into the mind of Ali. 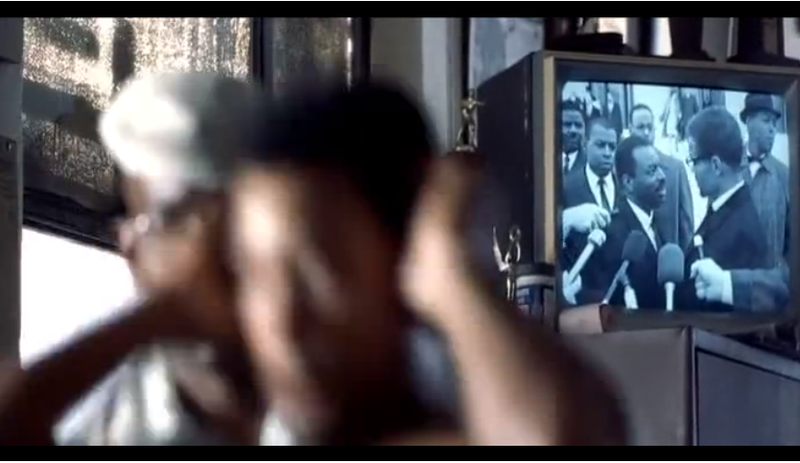 They choose to go with a medium shot that blurs out Ali and brings focus on the television in the back which is showing Malcolm X at a press conference.This serves to reason to the film one is to connect Ali further to Islamic beliefs and to foreshadow the future of Malcolm X, who is shot while approaching the podium at a race group meeting.These types of messages are spread throughout the entire movie like the explanation of why he even became to be Muhammad Ali or his historical brawl with the United States government in order to be reinstated with his boxing license and withdrawn from army enlisting.Showing the viewer that Muhammad Ali is unlike any other boxer who has ever lived not only because his power and skill in the ring but also because the confidence he had to stand up for his beliefs outside of it.Making sure that moments such as these were not unseen in this movie helped create a sequence of events that explained why his triumph was such an extravagant feat. There is also great camera work used inside the ring such as the addition of lighting and brightness to emphasize the glam of the moment.Also how during each fight they would show the denominator of each round first.For example, during every round of Joe Frazier fight it would begin with a shot from the back of Frazier as he walks out or looking directly at his face. However, this movie is all brought together by the phenomenal performance of Will Smith.From the opening sequence you can see the work he has put in before even setting foot on the set by create the build of Muhammad Ali.He doesn’t miss on any parts of Ali’s personality down to the accents and flamboyance of memorable press conferences. In all this movie is great in multiple aspects both historical and just plain sport value.It speaks to the portion of audence that came to watch because they either watch or heard of Ali amazing boxing career and the one who have no clue of who he was before the movie began.You feel like you are right beside him in his fighting corner as he knocks down barriers.